Since then this small protest gathering has gained considerable momentum and is now being called a political ‘movement.’ This movement has continued to grow and has spread to cities and towns all across the United States including the Alaskan tundra! It has also spread around the world from Tahrir square where Egyptian protestors declared they ‘stand in solidarity with OWS’ to Italy, Germany, Great Britain, Spain, Japan, Australia, South Africa, Canada and elsewhere in hundreds of international cities on five continents across the globe. So what’s going on? At its core, I believe this movement is a harbinger of revolutionary global social, financial and political change and is a direct manifestation of the Astrology of 2012. Have you noticed the growing number of references recently to the 1960’s? People have been saying that what’s going on now with OWS reminds them of the anti-war protests and sit-ins that happened during the ‘60’s. These people are rightly comparing these two-time periods because they do indeed have a powerful common connection and it’s astrological. That common connection is Uranus and Pluto. During 1965-66 Uranus and Pluto came together three times in the sign of Virgo at 16 and 17 degrees. Astrologers call this ‘coming together’ between two planets a conjunction. Conjunctions always begin a new planetary cycle between two planets. Most people are familiar with a very common planetary cycle — the cycle between the Sun and Moon. Every 28 days the Sun and Moon begin a new cycle we call the New Moon. Though each Sun/Moon cycle lasts for 28 days, we primarily recognize and pay attention to only four days during their cycle: the New Moon (conjunction), the 1st quarter Moon (waxing 90 degree square), the Full Moon (180 degree opposition) and the 3rd quarter square (waning 90 degree square). Astrologically, the most important times associated with ANY planetary cycle occur during these same four distinct events: conjunction, 1st quarter square, opposition, and 3rd quarter square. Since the total length of any planetary cycle depends upon the relative speeds at which the two planets involved orbit around the Sun, different planetary cycles take different amounts of time to completely unfold. For example, while the Sun/Moon cycle takes only 28 days, Jupiter/Mars cycles take a little over 2 years, and Saturn/Uranus cycles take 45-46 years. The cycle between Uranus and Pluto takes 127 years! What began as a new cycle between Uranus and Pluto in 1965 is now approaching its next important point of cyclic unfolding – its 1st quarter square. The place to begin our understanding of this important astrological event is with a brief explanation of the archetypes associated with the planets and signs involved at the start of this cycle. This is because the starting point of every planetary cycle foretells what will ultimately unfold in that cycle. Thus we’ll begin with an archetypal description of the planets Uranus and Pluto, and of the sign Virgo. Uranus represents the principle of revolution and liberation. It frees us from the limitations of old ways that are preventing further evolutionary growth and change. Pluto represents the life, death, rebirth process. It facilitates evolution at the deepest and most profound levels. Virgo represents work, health (including environmental health) and service. Its energy typically manifests through crises that require thorough analysis of problems so that necessary adjustments can be made that will bring about healing or resolution of those crises. Anyone who lived through the ‘60’s in America can certainly attest to it being a time of crisis and great revolutionary social change. The fight for minority rights resulted in landmark Civil Rights legislation President Johnson signed into law in July 1964. The Women’s Liberation movement gained attention and prominence as it further evolved. Tragically, it was also a time marked by many deaths as assassinations took the lives of President Kennedy (November 1963), his brother Bobby and Martin Luther King (April and June 1968). The Vietnam War claimed more than 50,000 lives and still more loss of life occurred when four unarmed student protestors were shot by the Ohio National Guard at Kent State University in May 1970. Revolution was the zeitgeist of the time as protests broke out all over the country demanding social justice and political change. Fast forward to the present and consider the tenets of Occupy Wall Street. The movement is calling attention to extreme income disparity and wealth inequality, high unemployment, lack of affordable health care for all, erosion of individual rights such as privacy rights, voting rights and worker’s collective bargaining rights, degradation of the environment, unending wars and a system of government so corrupt that it is unable to solve the crises at hand and has lost credibility with its citizens. In short, OWS protests decry corporate and government policies that pursue profits at the cost of people and the environment. Indeed revolution is once again in the air and in the streets! So what will Occupy Wall Street accomplish? Let’s take a look at the chart (12:00 pm, September 17, 2011, Manhattan, New York) to see. With Scorpio on the Ascendant, Pluto is the ruler of this chart. As stated earlier, Pluto is associated directly with evolutionary growth. Evolution is facilitated by choice-making. Specifically, it is facilitated by free will choices. The $64,000 question is, “What choices will the Occupy movement make?” Equally important of course is what choices are made in response to the protestors by those in positions of power. Pluto is in Capricorn in the second house. The second house is about resources, particularly those resources necessary for survival. OWS argues that the inequitable distribution of resources is at the very heart of our financial crisis. Pluto in this second house reflects the need for evolutionary change relative to wealth distribution and the economy. In turn, Saturn rules Capricorn and is in Libra in the 11th house. Libra represents extremes. This is why Libra is associated with the need to learn balance, fairness and equality. So it appears that OWS is on to something as it points out the extreme inequality of wealth distribution and income disparity between the rich and poor. Some background info about Capricorn is in order before we go any further into this chart analysis. Capricorn represents the principle of contraction. Transiting Pluto entered Capricorn in January 2008. While the global economy grew during Pluto’s prior 1994-2008 passage through Sagittarius, the sign representing the principle of expansion, it began to contract just as Pluto entered Capricorn. Pluto’s change of sign from Sagittarius to Capricorn is reflected in the economic downturn that has diminished the personal resources of so many over the past three years through job losses, decreases in 401(k)s and retirement accounts and housing foreclosures. This same contracting influence has also led to growing government debt as tax revenues have significantly decreased and benefit costs have simultaneously increased due to high unemployment. It should be no surprise then that the subject of increasing political debate worldwide over the past three years has been debt and deficits. Clearly, we’ve reached a point in time where we must make decisions (choices) about how to resolve the financial crises that threaten the global economy. Pluto is trine (120 degrees apart) retrograde Jupiter (rules Sagittarius and therefore expansion) in Taurus in the 6th house (the workforce). This symbolizes how massive the financial crisis is among the working class. The 6th house is naturally associated with Virgo so Jupiter’s position here confirms that the problem of how resources are shared has indeed reached a point of crisis. Pluto in Capricorn is just about to be exactly squared by Venus in Libra in the OWS chart. Venus rules money and resources. Libra symbolizes the need to learn how to be in relationships as an equal – not dominating or being dominated by others. This core astrological signature represents Occupy Wall Street’s focus on the gross inequality and unfairness associated with extreme income disparity; the rich dominating the poor. Venus sits near the top of the chart and is therefore in a stronger position than Pluto. Venus has also just opposed (180 degrees apart) Uranus, the planet of revolution which is also forming a square aspect (90 degrees apart) to Pluto. Working class people are fed up and are beginning to take their power back. OWS is demanding change to the status quo (Pluto in Capricorn). Venus seems to be saying that the changes (choices) needed to heal the economic crises will be championed by the power of the people (Venus in Libra), not the people in power (Pluto in Capricorn). Ordinary people will lead the way towards change. The most dynamic feature of this chart is the 10th house Mercury squaring the Nodes of the Moon. At 14 degrees Virgo (crises) Mercury is only two degrees away from the degree at which this current Uranus/Pluto planetary cycle began in 1965 (16 degrees Virgo). Mercury rules information and communication and the 10th house rules leadership. A simple interpretation of this astrological signature is ‘speaking truth to power.’ And that truth is that the majority of people are in crisis! Mercury in Virgo also indicates a need for clear analysis of the facts of the crisis. It signifies the need for changes that can ultimately resolve the crises. Pressed for ‘demands’ OWS has consistently said it is dedicated instead to initiating a necessary and truthful conversation (Mercury) about the needs of the people and how to best meet everyone’s needs, not just the needs of the rich. In Evolutionary Astrology, a planet square the Nodes is called a ‘skipped step’ and carries a karmic quality. Skipped step planets are always a primary focal point in any chart and reflect a lesson that’s been underway for some time but not yet completely learned because of the desire to ‘skip ahead’ before that lesson is fully mastered. The Nodes are in the signs of Sagittarius and Gemini. These are the signs associated with truth and honesty as well as lies and distortions of truth. The Nodes fall in the 1st and 7th houses of the chart which are the houses naturally associated with the signs Aries and Libra. Aries (1st house) and Libra (7th house) make up the ‘relationship axis’ and represent the goal of equality that enables everyone to get their needs met. The message of this skipped step is that the resolution of our current crises requires that people speak up and speak the truth. It also reflects the need to listen (7th house/Libra) to the voices and opinions (Gemini) of everyone involved – not just the powerful and the privileged. The ‘voices of the people’ are reflected through a tremendous diversity (Gemini) among the OWS movement participants. Occupy protestors represent all ages, races, ethnicities, political parties and work backgrounds. It is sadly symbolic that Scott Olsen, a two-term Iraq veteran, suffered a fractured skull and brain damage when hit in the head by a police fired tear gas canister as they routed Occupy Oakland on October 25th. As a result he sustained a loss of speech capacity – he lost his voice. Since then, he’s experienced a dramatic recovery and is once again participating in OWS rallies and marches. So far, the more those in power – the police and politicians – try to silence the voices (Mercury) of the common people (Gemini), the more they unwittingly energize the OWS movement. The resolution of this skipped step (Mercury square the Nodes) is symbolized by the North Node in Sagittarius in the 1st house. But the way forward toward that resolution is through the South Node in Gemini in the 7th house — listening to and treating as equal — the voices of ALL the people. This will bring out the truth which then must be faced head on. Interestingly, the Occupy movement has organized itself into ‘General Assemblies’ and is using an arduous but ultimately democratic consensus decision-making process to discuss and determine what actions to pursue on behalf of their members and mission. Perhaps the most intriguing thing to understand about the OWS chart however is its birth time. To explain the importance of this timing we must go back to the current Uranus/Pluto cycle that began in 1965. Historically, Uranus/Pluto cycles have always corresponded with progressive and irreversible global social revolutions. As mentioned earlier, this planetary cycle is nearing its 1st quarter square. The Uranus/Pluto 1st quarter square is at the very heart of the Astrology of 2012 and is the core astrological reason why the year 2012 is expected to bring about unprecedented global change! Tremendous forces of evolutionary and revolutionary change are already manifesting and there’s no doubt that more will come – LOTS more! Specifically, the energy inherent in any cycle’s 1st quarter square is characterized by the need to choose what forms to build or what type of structures must be developed in order to ultimately enable the fulfillment of the seed intention of that cycle. 1st quarter squares represent foundational structures and forms. Therefore, the revolutionary changes associated with Uranus/Pluto’s 1st quarter square will challenge us to create new forms of social, governmental, political and financial structures and institutions. OWS members say they are committed to creating a new, different and more equitable social paradigm. Indeed they are! On January 8th U. S. Representative Gabrielle Giffords was shot by Jared Lee Loughner in an assassination attempt that took the lives of six and injured nineteen other people in Tucson, Arizona. On January 14th Tunisia’s President Ben Ali stepped down as uprisings all across northern Africa called the ‘Arab Spring’ had begun. Protests spread to Egypt by January 25th and soon thereafter to Libya. On March 11th a 9.0 magnitude earthquake struck off the coast of Japan and was followed by a devastating tsunami. On August 5th the first-ever U.S. credit rating downgrade happened after Congress nearly failed to reach a deal to raise our debt ceiling. The Gadhafi government was finally brought to an end with the dictator’s death on October 20th and on November 12th Italy’s Prime Minister Silvio Berlusconi stepped down marking the greatest political change in that country in over 20 years. That’s a LOT of global social, financial and political change in a relatively short period of time and it’s only a partial list of events! It’s worth noting that while the overall influence of this 1st quarter Uranus/Pluto square is already underway, this square aspect will not technically be exact for the first time until June 24, 2012! Thereafter, Uranus and Pluto will exactly square one another a total of SEVEN TIMES between June 2012 and March 2015! Remember, the beginning of this cycle, when the exact conjunction of Uranus and Pluto occurred three times, was between October 1965 and June 1966. But looking back, we know that its overall influence was felt for years before 1965 and years after 1966. In total, the influence of the beginning of this current Uranus/Pluto cycle lasted for nearly the entire decade of the ‘60’s. Similarly, the current Uranus/Pluto 1st quarter square’s influence will be felt for more than the three years of its exactitude (2012-2015). Astrologers expect the total time of influence and manifestation of this Uranus/Pluto 1st quarter square to last from about 2008 to about 2017. Of course, this timeframe includes the year 2012! In astrology, timing is everything. And the timing of the birth of Occupy Wall Street has taken place within just a few months of the first exact 1st quarter square between Uranus and Pluto which is the cornerstone of the Astrology of 2012. 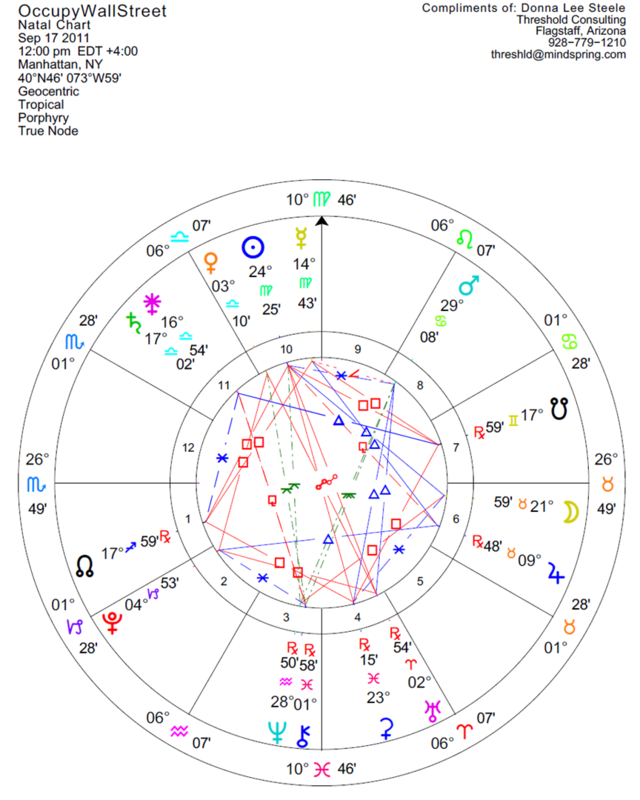 So the birth of the OWS movement correlates with the timing of the Uranus/Pluto 1st quarter square which itself correlates directly with the Astrology of 2012. As stated earlier, we know that global revolutionary social change always occurs with a Uranus/Pluto cycle. Protest movements come and go, but in my opinion, the timing of OWS clearly sets it apart from other uprisings in quite a remarkable way. The birth time of OWS both reveals and portends that it is on to something and that something is BIG! So what can we expect from OWS in the future? Occupy Wall Street’s goal of speaking up and speaking the truth has the potential to keep growing for at least another couple of years or more. In addition to the upcoming seven Uranus/Pluto squares that will occur between June 2012 and March 2015, this timing is also reflected in the aforementioned square forming between Venus and Pluto in the OWS chart. A common astrological method used to ‘progress’ charts forward in time reveals that the Venus/Pluto square won’t actually be exact (90 degrees apart) until February 3, 2013. Until then, its influence will surely continue to grow and accordingly, so will the influence of OWS. By similar progression, the square of Mercury to the Nodes will not exactly culminate until June of 2013. Some say OWS has already been successful. The movement has not only gone global, but has also changed the prevailing political discourse (Mercury) from ‘out of control deficit spending and big government’ to the ‘extreme income disparity’ at the root of the financial crisis. Some also credit pressure from the OWS movement with Bank of America’s decision to rescind its ill-conceived debit card user fee enacted last summer. The change OWS seeks to bring about is already happening. However, upcoming transits throughout 2012-2015 will surely test and challenge OWS’ resolve. If OWS is to continue to succeed it must maintain its core values of truth and honesty. It must also continue to be as inclusive as possible welcoming the voices and opinions of ALL who wish to participate. A peaceful (Libra) approach to restoring equality and justice will be required in order to prevail so OWS must also remain true to its principles of non-violent protest. Finally, it must focus steadfastly on creating a radically new and different social, cultural, financial and political paradigm. This new paradigm must be consciously designed to meet the needs of EVERYONE. Fortunately, the time is right for this kind of revolutionary paradigm shift as we enter 2012 and the approaching 1st quarter square between Uranus and Pluto! This entry was posted in World Events and tagged Aries, astrological chart, Capricorn, change, financial crises, Gemini, honesty, liberation, Libra, Moon, Occupy Wall Street, Pluto, protest, revolution, Sagittarius, Scorpio, status quo, Sun, truth, Uranus, Venus, Virgo, Wall Street. Bookmark the permalink.